The customer had requested a high quality bagging solution, robust, reliable and flexible, but adapted to the tight space already available in the plant and capable of filling both 25 kg bags (55lb) and 800-1000 kg (1700-2200lb) bulk bags, required by the local market. The technical solution offered by Concetti spa has optimized the space, to make the most of the selected machinery, in addition to reducing the capital investment. The installation, for example, uses a single net weigher, meeting the requirement of the customer to have two bagging solutions with a single complete line. Dosing is by net weight scale NET / N – one for both filling machines – and a conveyor belt. The product is weighed in a separate weigh hopper and is then discharged into the bag, or, alternatively, deposited on a conveyor belt linked to the bulk bag filling station, with multiple weighments making up the 1000Kg load. The sacks are filled by a fully automatic IGF 600, specifically designed to handle PE readymade open-mouth bags. Capacity up to 600 bags / hour, depending on the fluidity and type of the product. 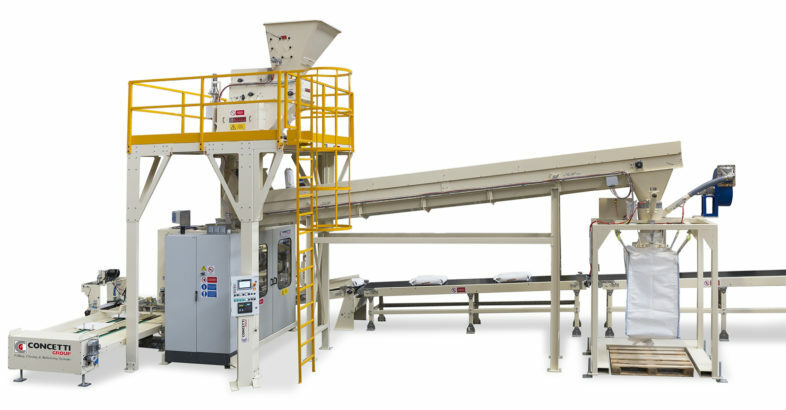 Concetti supplied the line complete with a PS-3A four-column robot palletiser. The big bag filling station has a capacity up to 8-10 big bags per hour and requires the presence of an operator to fit the bag mouth to the bag-spout, close it and remove it with a forklift when filled.